From gold-kissed French finery to white-dinner-jacket Italian, the 10 places in Dallas where you need to eat right now. The trends this year were French and Italian. And they were fine—as in Christofle silver and chandeliers. If you had not brushed up on your accents aigu and grave since French class, there were delicious and tantalizing ways to do so, in buffalo triple crèmes, pâté en croûte, and duck à l’orange. (As a dual American-French citizen, I find comfort in accurately placed diacritical marks.) We also got Italian arias, personal takes that brought Wagyu meatballs but also the glam of shaved truffles from Piedmont. 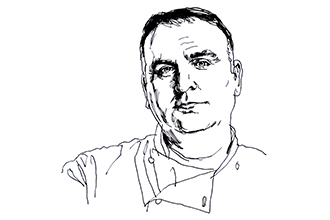 Those attentive to the arcing paths of chefs noticed serendipitous crossovers. 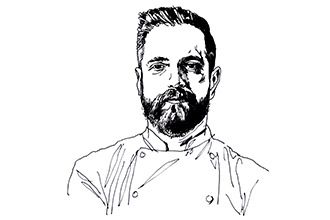 J Chastain, who was on the line when Bruno Davaillon was executive chef at The Mansion, opened a solo venture—and so did his mentor. Misti Norris took her first steps in whole-animal butchery with charcutier king David Uygur, and they both found new places for those passions to touch down. 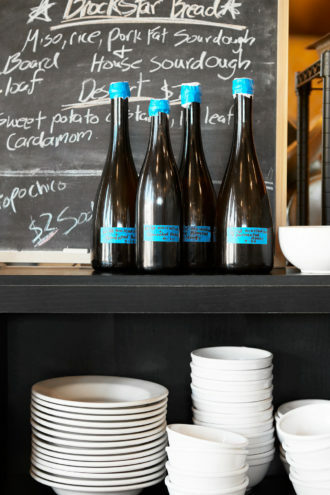 In their intimate venues, they unequivocally upped our charcuterie game and brought us along. A staunch roster of chefs helped provide ballast as we weathered some storms. Particularly toward the end, as my dining cutoff approached (October 1), owners and chefs parted ways, vast menu changes loomed, and I found myself facing the painful side of the business. Let this list be comfort. The crème rose to the top. Bullion’s pâté en croûte, a French farmhouse creation of pastry-encased forcemeat and aspic, exemplifies this year’s marriage of simple and intricate. 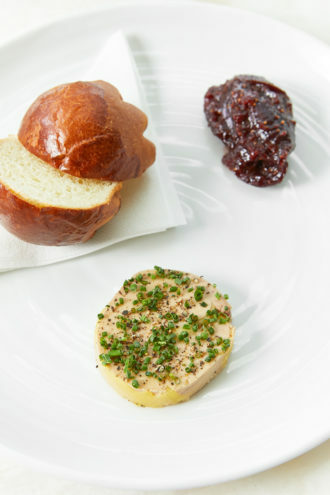 An impeccable foie gras torchon with house-made brioche. Dallas may not have known that it needed a brasserie of Bullion’s nature until this golden bubble floated to the surface. You might say the lesson was easy. Lovely at night, it lit up its corner of downtown with a golden glow, all elegance and clean lines. You could feel the luxury, whether noshing in the lounge or at lacquered-wood tables, basking in muted light, attended to with impeccable service. It was a place for nibbling impossibly airy gougères, letting the steam of their centers and the warmth of the panisse (chickpea custard) lull you into close-your-eyes pleasure. 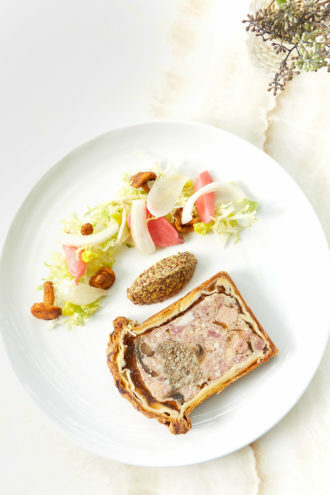 You could fall in love with pâté en croûte or give in to the lure of the foie gras torchon, made by someone—chef Bruno Davaillon—who has spent decades perfecting it. Davaillon, after more than a year between his executive chef position at the Rosewood Mansion on Turtle Creek and the unveiling of this shiny bauble, poured himself into the project as though in search of lost time. He is a rare talent who can make a fresh fig and shaved fennel salad with an almond tuile feel like an almost-forgotten dream. Coin-shaped escargot ravioli—with tendrils of anise-y aroma, bathed in a butter sauce—seems infinitely simple, but is not. It’s brasserie food, so finessed as to seem impossibly urbane. Entrées bring out Davaillon’s French soul. Scallops with cabbage and Ibérico ham that reminded me of Alsace. A dish from Lyon, feather-light pike and bass quenelles that resemble soft, lobster-scented clouds. 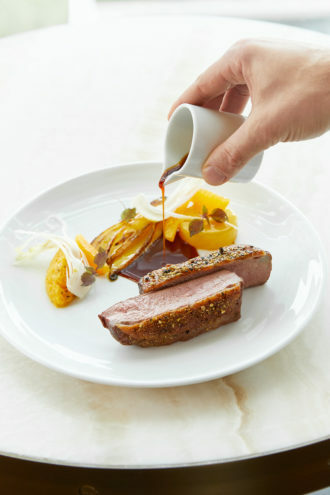 In his hands, duck à l’orange, a juicy breast capped with crisp skin, was one of the best dishes of the year, an enchanting and beautifully executed composition, served with roasted endive and a medallion of braised daikon radish, the rich meat balanced by the mild bitterness and a raw-orange “marmalade.” A glossy sauce just barely graced the plate. Some are a particular day’s special, requiring extra opulence and attention, like the crabe farci, a beautiful orb of savoy cabbage that holds crab, the plate lavished with salmon roe scattered in a beurre blanc. I clapped at this, the province of Wednesday. Davaillon keeps a schedule. Thursday is the province of rabbit, Friday that of Dover sole. 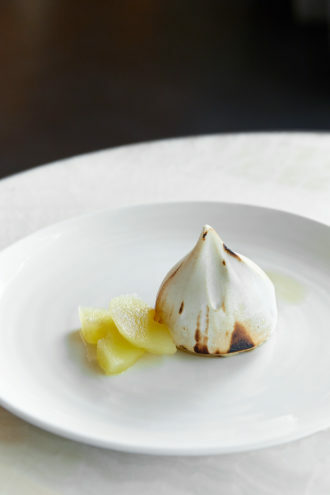 A modern take on canard à l’orange, and a teardrop-shaped baked Alaska aren’t Bullion’s only indulgences. Pastry chef Ricardo Sanchez is a match in talent and craftsmanship. His madeleines, with a delicate crunch and lemon-kissed crumb—a marvel—equal in rigor the tarte au citron with lightly deconstructed meringue, the baked Alaska touched by little tongues of flame. His mille-feuille’s Arlette puff pastry crackles and shatters, rough-edged but refined. His ice creams have a kinship to silk. While the wine list touches all the regions of France—the Jura’s vin jaune and Corsica’s wild reds—with a cartographer’s loving caress. Which meant that from beginning to end, an evening perfectly encapsulated a contemporary brasserie’s stylish ease and grace in a way—both humble and profound—that could move the homesick to tears. I confess, I am one. And I was. 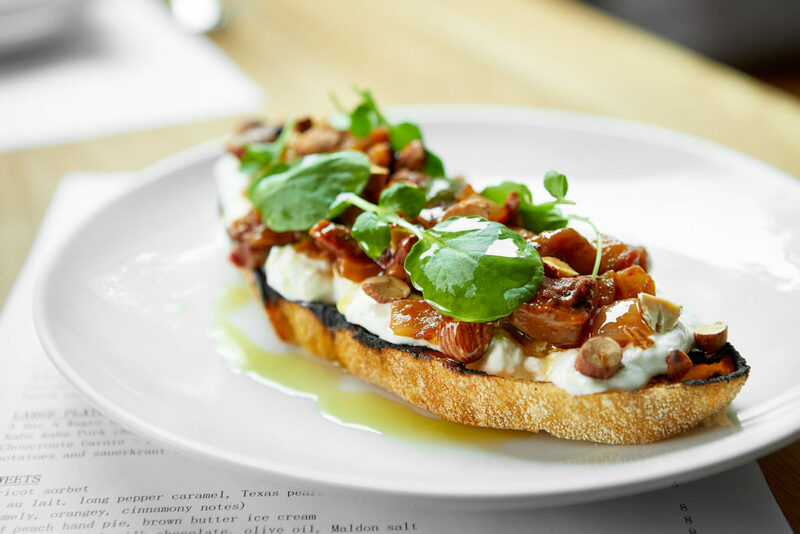 Shareable plates include humble yet sumptuous toasts topped with layers of stracciatella, a summer caponata, almonds, and basil. With Macellaio, Jennifer and David Uygur, the couple behind the intimate Lucia, have created another restaurant that feels like a home. Jennifer moves through the crowd, recommending wines, and David, in the kitchen, builds on his style at Lucia, expanding on his charcuterie. (That is the key here: Macellaio means “butcher” in Italian.) Not far from the still-beloved Lucia, the Uygurs are in their element. Here they are aided by chef de cuisine Anthony Bombaci and bar master Ravinder Singh, who takes a journey through amari, blending their bitter notes in balanced cocktails. The joy bubbles over, contagious. On a corner of Bishop Arts, there is a seat for you at the counter. Inventive small-format plates are always intelligent and original. There are ducks’ tongues. A tomato salad with tomato skin, garum, and tomato leaf oil, bursting with sweetness. Snails on skewers with a sauce deepened with house-made sobrasada. And a celery salad with house-cured boquerones, buttery Castelvetrano olives, and a honey note that sings like concentrated propolis. 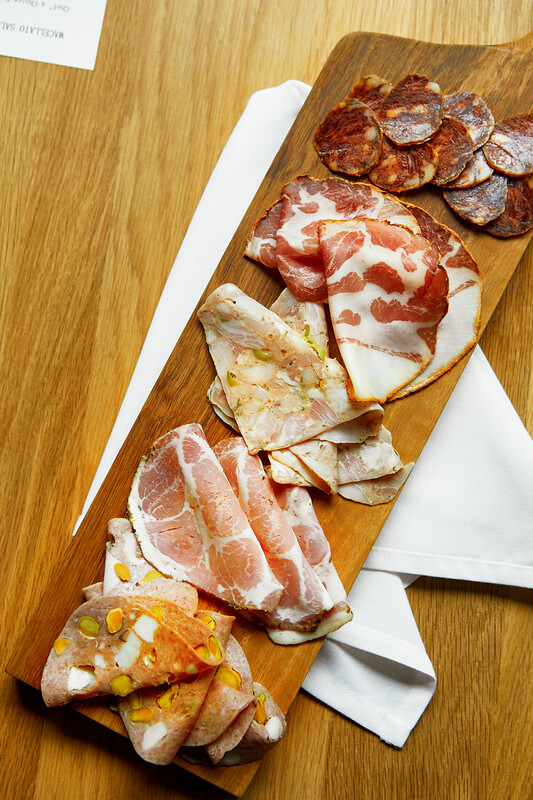 The impressive charcuterie list is primarily crafted from heritage Red Wattle pork, and includes a culatello aged for more than a year and a prosciutto aged for more than three years at Lucia. Tartines expand on daily breads—oat sourdough or focaccia with fennel and raisins. (Is pure bliss the one with stracciatella on cocoa bread or the one that unites tomato with the sweetness of honeycomb? Why decide?) Dessert might be a cherry-frangipane tart, peach hand pie, or bread slathered in chocolate spread and drizzled with olive oil. The cumulative effects leave you impressed with the aptness of flavors and their sticking power as small revelations. At Macellaio, it didn’t take me long to realize that it was possible to have a second or third dinner, a second or third après-dinner snack at the counter, the waves parting, making room for another to join. You could always tell the first-timers, with a bevy of plates around them, basking in the glow. You could go heartier: a gorgeous steak with fermented chile paste. Or the take on aligot, nutty Gruyère twirled and ladled as in the hearty Alpine fare. They nudge you out of familiar patterns and into new ones. But every bite tells the same story of care. You might wonder, ultimately, what is making it all so special. Because they have the grace to make you feel it’s just for you. In this throwback saloon, the dining room holds taxidermy. 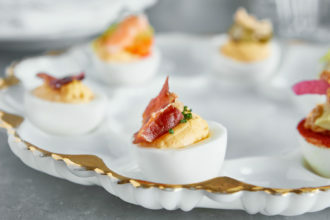 Deviled eggs feature blue crab and crispy ham. A seafood platter presents daily oysters. 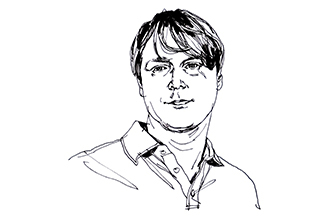 A risk-taking, daredevil entrepreneur, Simon is known for revitalizing Henderson Avenue. Before his departure from Dallas, he partnered with Nick Badovinus to open The Porch, Hibiscus, and Fireside Pies under the name of his Consilient Restaurants. He opened The Joule’s CBD Provisions. And then he went to Iceland. Now, with his new company Rebees, he’s the man in Victory Park. 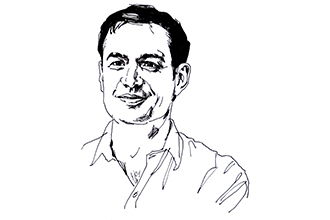 When Tristan Simon returned to the scene this year, it was as a mythmaking fabulist. Back from a hiatus that began in 2014, Simon was accompanied by a figment of his fancy that he named Billy Can Can and installed as the wink-wink proprietor of his Victory Park watering hole. (Former Dallas Morning News critic Leslie Brenner provides Billy’s voice on social media.) And once I bought into the fiction, I couldn’t deny the fact that Simon’s latest restaurant rolled out exceptionally smoothly from the start. Like a grand 19th-century hotel saloon, Billy Can Can conjured a version of what I would imagine if Charles Dickens and Mark Twain were to head west, alighting in establishments where oysters were brought up from the coast, bartenders harnessed strong liquor, and the predilection was for wild game. In the grand-adventurer lodge atmosphere, the taxidermied buffalo and white peacock enthralled me, yes. But mostly the food. On the menu were deviled eggs that came served on Victorian-style gilt-edged plates, like intricate Fabergé eggs. Meanwhile, a roguish spirit prevailed in crispy skate schnitzel topped with a gribiche of smoked farm egg with a caper zing. An elegant seafood chopped salad came served with a blue enamel spoon that would be more at home on a chuck wagon. Everywhere, chef Matt Ford’s kitchen reached for depth. Fine workmanship proved a seasonal point in an end-of-summer tomato salad’s melon, paprika-laced fried ciabatta, and knots of cured country ham; the peaches in a cobbler; the thick, long-bone pork chop’s ingeniously un-Prohibition-era bourbon brine. I contemplated, as I sat before the impressive carved-wood back bar, the virtues of a gin cocktail with egg white and orange-blossom honey, and how well it worked with my dessert, morsels of pâte à choux to dip in warm chocolate mole. The latter leave spice on your palate before you step back into the real world from the pleasures and pursuits of this latter-day saloon, the barroom unstuck in time, that Simon seemed to know we needed. The Adolphus Hotel’s recent remodel ditched the 1980s pastel-hued cherubs in favor of more restrained Venetian plaster and white silk. Dispensa brings experience from working for high-profile names like Gordon Ramsay and Heston Blumenthal. At Blumenthal’s restaurant Dinner in London, historic gastronomy mines haute technique. It’s famed for “meat fruit,” a chicken liver parfait in the shape of a mandarin. 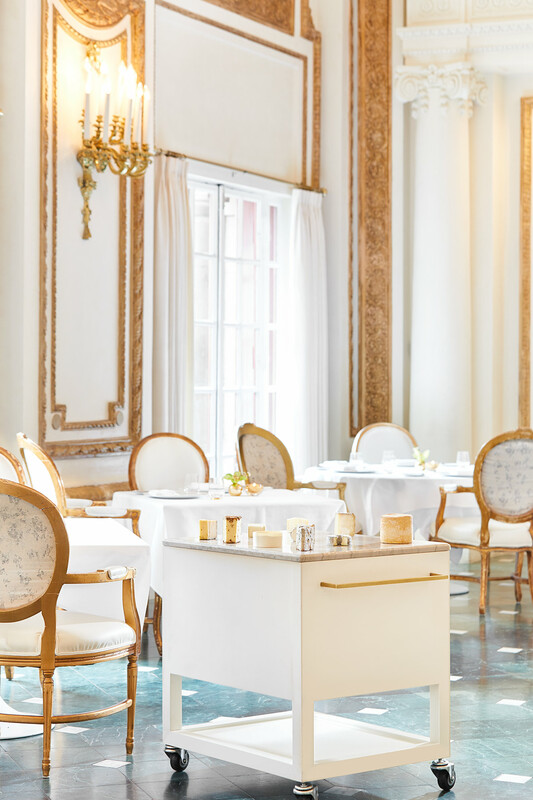 When the Adolphus Hotel’s French Room emerged from its remodel, what was unveiled was an Escoffier dollhouse with Venetian glass, hand-painted gold trim, and snowy plaster. Sumptuously and smartly restored, it was a classic French aristo-dream, where a tasting menu could take you through elaborate constructions served on monogrammed plates with the fine, gloved hand of service. A pared-down Versailles that turned into an exquisite place to play. We had classic finery before this, but nothing quite so classically French. You could encounter the brilliance of a superbly clarified consommé with elfin ravioli, a golden pool in a gold-rimmed bowl. (Perhaps your first, most basic, classic-French revelation.) I’ve had a poached lobster and crab salad with an almond tuile demurely hiding crab meat, accompanied by sorrel purée and nasturtium leaves, and halibut over a lightly cured “choucroute” with chanterelles. Fine and beautiful work. A wheeled cheese cart carrying a fantasia of cheeses and figs poached in lavender was peerless, matching a menu with the refinement of mousselines and galantines and the modern allure of foamed and lightened sauces. Wonderfully cooked fish with souffled pommes Dauphine in a watercress sauce was delicately handled, while wine pairings, drawn from a 60-plus-page list, were always worth it. In this unquestionably stunning setting, dining felt majestically simple. And there is The French Room Bar, also chastely kissed by Midas, offering a place for absinthe and yellow Chartreuse. Or maybe a Sazerac, or a beluga vodka and caviar martini with sea beans made tableside. A new chef (Anthony Dispensa) and menu debuted as we went to press. New was still the name of the game. 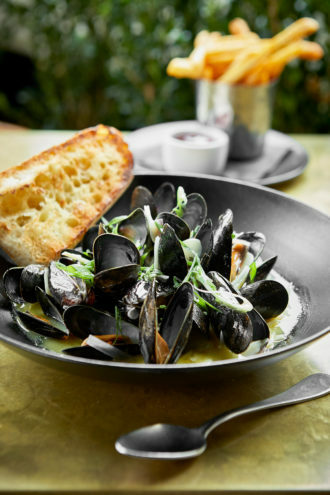 Four versions of mussels and frites include the classic marinière with white wine and shallots. 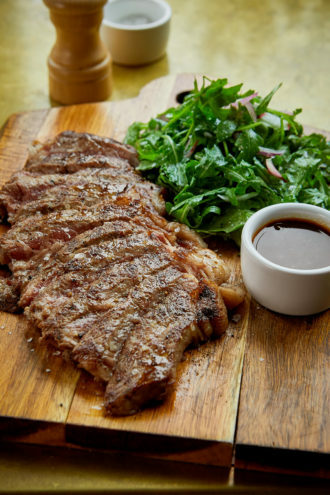 The steak frites is a wood-fired Akaushi New York strip. 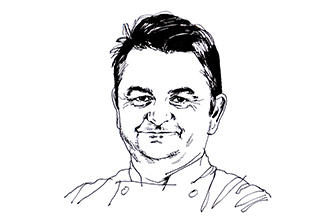 Courseau’s home is a brisk four-block walk from his new restaurant. His dream was a high-ceilinged brasserie open all day, with a revolving door, brass fixtures, and a hedge around the patio, like a quaint sidewalk cafe that feels like it belongs to the neighborhood. 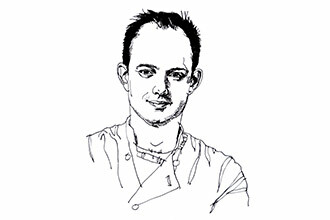 Ask him his own favorites, and he’ll list New York’s Balthazar (near which he lived for years) and Paris’ Brasserie Lipp. Westaurateur Stephan Courseau created the casual little sibling he wanted to accompany his tonier Le Bilboquet, with an uncomplicated name to match. 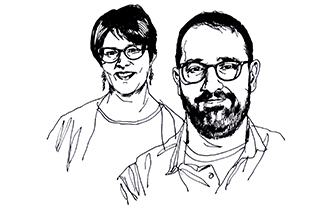 Chefs Melody Bishop and Dennis Kelley, well-hired but short-lived, opened Up on Knox with France-meets-California leanings. Now, under new direction, the menu is a tight, concise lineup of beautifully approachable French brasserie fare, with a welcome lightness and nonchalant air. Take off your coat, brush off the rain, find a seat in the stylish spot with plenty of two-tops. Servers wear “marinière” blue-and-white striped shirts, and garnishes are soft, dainty salads with fresh herbs. Mais oui, you want eggs in the morning, gently scrambled and mounded onto levain toast with dollops of crème fraîche and caviar. And maybe the quiche Lorraine, a fortress of crust with a silken center hiding smoky hunks of lardons. 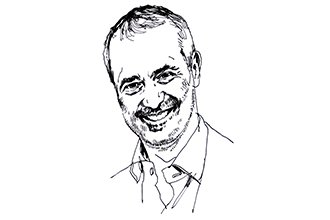 There is an omelet, a perfect yellow hull, unctuous with Gruyère. Mussels prepared à la marinière open fragrantly to a sauce redolent of white wine, garlic, and herbs. You want, maybe, the simple accomplishment of a frisée salad with a poached egg. Or a pavé of salmon with melted leeks and savoy cabbage—a voluptuous symphony with which I fell immediately in love. The spot offers the brasserie hallmarks: simplicity and respect for ingredients, a breezy softness and avoidance of stark contrasts. It’s got that French quality of being straightforward and good and, to all appearances, effortless. And, of course, an immaculate Akaushi steak frites. Do you want to return in the morning for the soft-boiled egg with buttered baguette “soldiers”? Yes. Don’t overthink it. Godfather vibes emanate from the small dining room stuffed with blue Venetian plaster, black-and-white hexagonal tiles, and exposed brick. 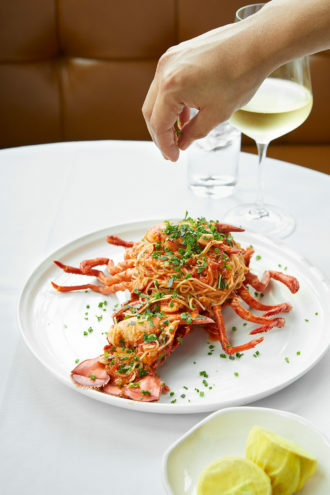 Barsotti’s house-made pasta is the centerpiece of lobster fra diavolo. Up a flight of stairs, hidden behind the Highland Park Village Theatre’s marquee, Julian Barsotti’s upscale Italian-American fantasy involves servers in tuxedos and angel hair pasta stuffed into a lobster shell. 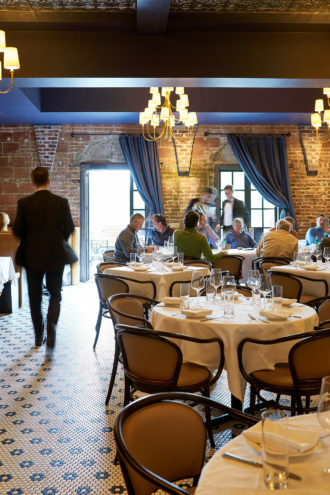 For his fourth restaurant, the Italian maes-tro throws diners back to another era in an homage to bastions like Galatoire’s, and to his Sicilian-born paternal great-grandmother, whose maiden name was Fachini. It is an evening laced with New Orleans flair and the formal air of dinner jackets and Negronis—half theater, half nostalgia. It all begins when they set down the garlic bread, which you know only from your dreams, a made-to-order conflation of oregano, chile flakes, butter, and olive oil that has surrendered into delirium in the heat of an oven’s fire. Immediately, you discover you are ravenous. Rarely have I seen a chef approach red sauce with such solemn decadence. You could measure the bravado by the creation of fried angel hair presented in the style of a cacciatore, with shiitake mushrooms boldly melding with the flavors of pancetta and quail; the reverence for legacy by the tenderness of the exemplary carpaccio, a faithful reference to the original at Harry’s Bar in Venice. But you did not need a hidden entrance to tell you the experience would be transportive. 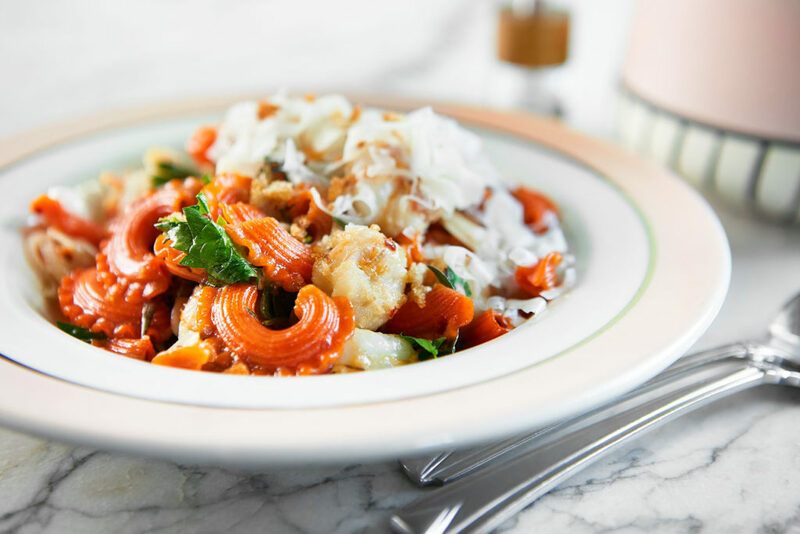 There are Barsotti’s handmade pastas with sieved, soft sauce. A head-turning beet salad that wears iceberg lettuce like jewels and Gorgonzola cream like a mink stole. Oysters Rockefeller, a tableside Caesar made for two, and preciously sourced Wagyu with cognac cream sauce and sweet cipollini onions. It is the quintessential Italian-American red-sauce meal you dream of. If you fetishize the veal Parmesan, is it a crime? I doubt it. Not even a scandal. The Charles in the Design District is like the set of a film. Like Fellini in Technicolor—Corinthian column capitals over steel bases, pastiches of pinups in both bathrooms, and back-lit marble. (Or maybe it’s more like Chihuly, Fellini, and the Medicis had a love child.) Co-owners Chas Martin and chef J Chastain conceived an opulent and lavish opus that’s neoclassical, neo-Italian, and utterly fabulous. One evening’s special, Chastain’s hand-pulled burrata, is wickedly indulgent with cream. The sauce for a pork blade chop glosses the lips. And a humidity-controlled cigar box comes out for rye linguini in butter that will be delicately fluttered with Italian white truffle. Chastain meets eye candy with gravitas. 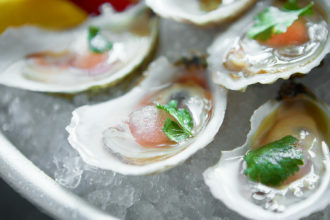 On a lively night, when cocktail shakers deliver martinis and wine flows from the well-appointed list, wood-fired oysters make a show of crisp pepperoni and trail crumbs of crispy kale, lemon oil, and smoke from the grill whose flames char vegetables and protein and whose smoke you smell from the valet lot. The oysters are not shabby with a bubbled, bronzed shield of cheese-filled focaccia; and later a lovely affogato with brown butter crumbs. I can still taste brick-red creste di gallo pasta, flavored with paprika and tossed with juicy rock shrimp and slivers of bold garlic. I’m still awed by the gorgeously tamed chop prepared sous vide and then on the grill, with the round, redolent pleasures of fennel pollen and tang of orange. Chastain worked with Stephan Pyles and at the Rosewood Mansion on Turtle Creek under Bruno Davaillon before this. Here, his intent is clear, and it involves toasted farro, bitter radicchio, and scattered pistachios, fennel pollen and candied kumquats, but neither mystery nor tradition. Chastain was, until now, a highly talented culinary enigma. Now, he is deliciously not. 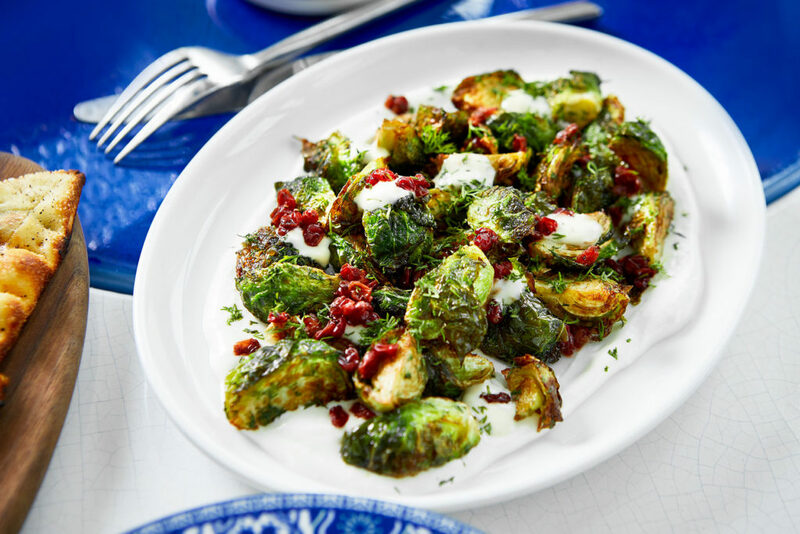 Mediterranean small plates include wood-grilled Brussels sprouts strewn with barberries, yogurt, and fresh herbs. José Andrés, the celebrity chef who has made a michelin star-studded career of small plates, brought his second location of Zaytinya to The Star in Frisco, and when I got over the cognitive disconnect, I relished the clash of other titans. The menu’s inspiration is Greek, Lebanese, and Turkish, drawing from all parts of the Mediterranean. What you’ll remember are beautiful landscapes a-swirl with color: a kale salad with pistachio brittle over sunshine-yellow fava purée, or wood-charred octopus with capers over a yellow-lentil base the color of saffron. Before the Michelin-starred celebrity chef opened his 29th restaurant, with its open grill (it’s wood-fired here, whereas D.C.’s is gas), he talked with friends, including Fort Worth live-fire barbecue king Tim Love. Given Texas’ love of meat—​specifically of barbecue—rotisserie lamb wasn’t such a strange fit. “It’s a natural,” he decided. Just with hand-hammered copper pots and Lebanese wine, not beer. Little bits of this or that pique your fancy. Tables are quickly covered by plates lapped in yogurt or bearing tart barberries—invitations for reaching, sharing, and scooping. Let your senses be your guide. And in the midst of it all, the warm, fluffy pita that will not stop coming. The rotisserie spit is well-acquainted with lamb. Tender shank sinks invitingly into a lush eggplant purée. On a lavish night, you may find a communal form of bliss when you splurge on a whole shoulder, bewitchingly musky and charred, to wrap in lettuce and anoint with toum, the garlic cream that trumps all sauces. In the excitement, you never forget to notice how dialed-in the flavors are, how lovely the service. Desserts transport, too: Turkish delight with orange-blossom honey gelée cubes, honey yogurt, and walnuts that reminds you of the best baklava. Raspberry mastic sorbet with the taffylike texture I remember from a trip to Istanbul. Tea poured from a traditional service is a stream of fragrance that spills into tulip glasses on a silver tray. But it’s all here, in a space in the colors of whitewash and stunning blue. 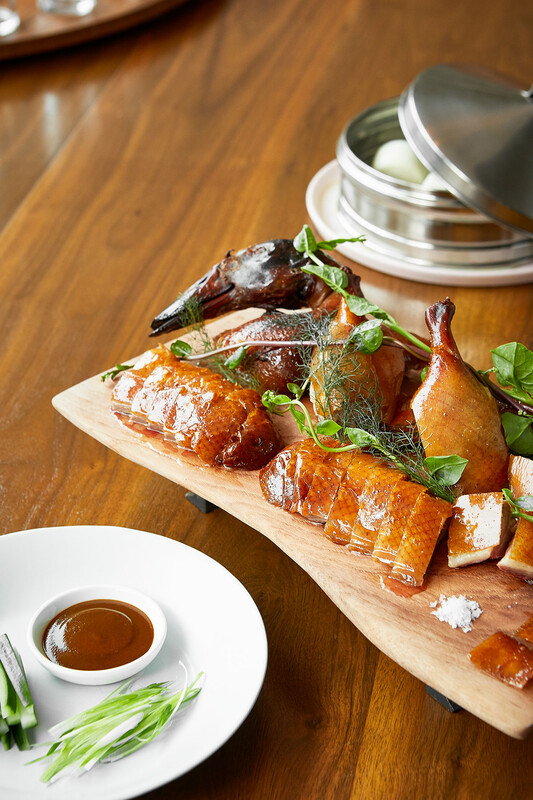 Buddhist ducks, roasted Cantonese-style, arrive at the table whole. They are served with mantou buns and house-made hoisin sauce. Fine China at the remodeled Statler gave us Cantonese roast duck, its lacquered skin crisp as crackling candy, with an oozy, fatty richness that turns oily between your fingers. The drops squeeze out like an unguent. Hernandez took the time between her former position at Top Knot and The Statler’s opening to study with the dim sum master at the MGM Grand in Las Vegas. For modern Chinese, she went to New York’s Chinatown, to work with the grandson who’d modernized Nom Wah Tea Parlor (open since 1920). Before, she had specialized mainly in French and Japanese-style cooking. Now she’s inflating duck skin with an air compressor and firing it in a ceramic-lined, wood-fired duck oven. This is the work of Angela Hernandez, young and ambitious, her career a bridge between modern and classical. She studied dim sum and wok cooking with the best chefs she could find in Las Vegas to prepare for her modern take on Chinese classics. Dishes I couldn’t get out of my head included the omelet stuffed with crab and rolled over itself, a fluffy mound; snowy-white cod; and the wok-fried flat noodles with a mushroom XO and a feathery shower of truffle shavings over the top. The latter also showed her versatile work with fermented black bean paste, the forbidding, mesmerizing elixir that adds depth to everything. I admired fried prawns’ garlic crumbles, addictive as pork ribs’ buttery fish caramel. But also the ginger-soy poached chicken, more tender than any you’ve had. And while not everything was perfect (the dim sum, in fact, was a work in progress, and had shifted even by the time we went to press), I’d seen and tasted enough to observe how the kitchen intelligently harnessed flavors and built layered edifices, silken, pungent, tangy, or smoky. Kyle Hilla’s cold-brewed tea infuses for two days. Iced oolong with vanilla and coconut notes, or chamomile fresh as a blossom, were mesmerizing as any cocktail, and hot tea paid homage to the Chinese tea ceremony gong fu cha with pu-erh. I craved them. Like the roast duck’s mantou buns and swab of house-made strawberry hoisin sauce. 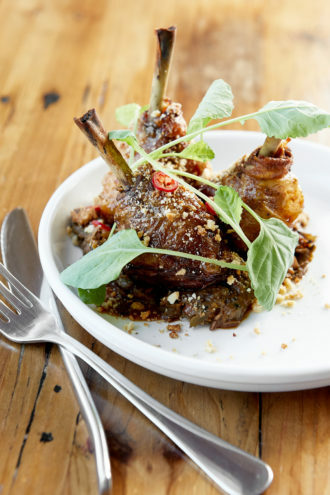 Cartermere Farm chicken legs with pork jowl, pickled peppers, and preserved biscuit crumbs. A rotating chalkboard menu showcases the seasonal, transformed through Misti Norris’ preservation techniques. 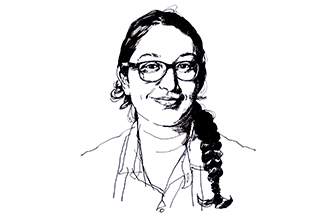 Poised between muscle and poetry, Norris—who garnered a following at Small Brewpub and earned a James Beard nomination for Rising Star Chef—did some soul-searching and then poured herself into her enterprise, afraid of nothing. (She put her car up for collateral.) Her relationship with small, local farmers is no lip service: she welcomes their overgrown produce. 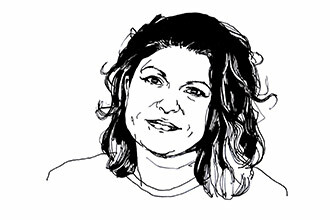 Experiments with sunflower hearts and ricotta cakes folded with crushed Peruvian purple potatoes are the purview of forager and trailblazer Misti Norris. Her Petra and the Beast—a converted gas station, home to Mason jars of pickles, funky flavors, and immense imagination—is the place where talent touches down. It’s a bit out of the way. But once you find it, you learn that everything in this food lab is lavished with affection. Norris, formerly at Small Brewpub, breaks down whole animals and makes an extreme sport of charcuterie. She serves Dallas’ most rambunctiously captivating board: herbaceous terrine laced with pig ear, whipped prosciutto, caraway ’nduja, rusty with spices and warmth, wursts of all kinds, and always koji-cultured butter you yearn to slather on everything that comes out of the kitchen. Her food is wildly captivating. She sends out bite-size bar snacks in paper barquettes to eat with plastic forks. Pastas might get doused in pig-ear ragù, or come served in pools of preserved lemon butter or shaped into heartbreakingly flavorful pouches filled with headcheese. Meanwhile, Saturday tasting dinners, the most interesting in the city, are occasions where sour beer meets its match. Tomato broth and cured magnolia petals infused in pear vinegar give a vial its floral, earthy charisma, while an egg-white and red-bean whipped billow’s depth comes from an XO made with prosciutto. (It also has pig’s blood, salted, curdled, and dried.) She’ll convert you to the power of alchemy. It isn’t something you get used to—it’s something you crave. I have heard Norris referred to as a rose in the desert, and I’ve seen her bar bites start furors. Unexpected ingredients come into her kitchen wild with potential and get sent out transformed. But so do you.